One of the longest running and certainly finest fanzines of the Redskin scene is back with its newest installment. - Vive les enfants de Cayenne ! - Loran et les Ramoneurs de menhirs. - Thierry Guitard et Miriana Mislov, encrés dans la rage. A new shirt design from Partisano, plus some items from the spring collection that never made it online because of the great accident. No time to add pictures now, those of you interested enough will be able to find your way to the website and see them. 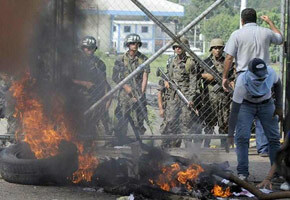 Honduras: Military Dictatorship Never Again! This newest in the already long and painful list of Latin American military coups comes as Hondurans were getting ready to participate in a referendum which would open the way for a constitutional change allowing presidents to be elected for more than one term, which is the current limit. Zelaya was seeking this change, in order to use a second term to continue to push ahead with progressive and social reforms. Clearly, a left of center President and his program of reforms is not quite the road that will lead to the destruction of state and capitalism. However, much as is the case with the current process in Venezuela, or even the case of Cuba, we cannot help but feel identified with the plight of the many in this country with over 70% of its population living in poverty who put their hopes into this path to at least a better life in Honduras, thus breaking decades of dominance on behalf of military juntas and right-wing elites. We in Latin America know full well what military dictatorship means and what dangers this implies for those engaged in social struggles. We also have learned very well through decades of experience who benefits from these dictatorships, and who lends the support to make them possible. For this reason, we should extend the working class of Honduras our total solidarity in this new fight and hope that, just as was the case in Venezuela a few years ago, this newest military uprising is quickly isolated and defeated. Fire and Flames – Fall 2009, Be Excited! So the graphic designer came over, and we had what here at Fire and Flames is our equivalent of a „meeting.“ We ate waaay too much, played kicker, got home, at some more, played FIFA 2009 (private note: „Graphic Designer“: Sos un fracasado y perdedor. Quejate menos y pegale mas al arco. Igual, lo importante es participar! ), and somewhere after 1:00 am actually started working. We dont have anything to actually show for our work yet, but we can say this: This fall there will be two new sweatjackets, in new colors and designs, as well as two new reversible jackets. Those of you who were, as we were, slightly dissappointed by the „beige“ jacket which was in the end olive green…should be excited about the new version. We will also be re-issuing the classic black sweatjacket, and releasing our first „winter“ jacket. Preview versions of the jackets will be posted here in the months to come so that we can gather opinions. Progress is also being made on CD/LP/and 7inch releases for the fall, more news on that soon. *Something* is better than nothing, or so we thought. 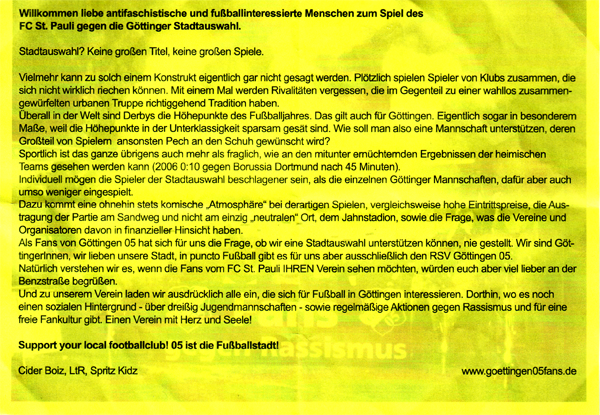 And since in my injured condition nothing is often precisely what Im doing, it was with that logic that it was decided to attend St. Pauli vs „Göttingen.“ Lesson of the day…something is not always better than nothing. Silence like in the theater and a level of play inferior to what could be found at just about every city park in Buenos Aires. Whatever, at least it was outdoors. „Highlights“ would have to be the third goal, and of course the naked freak who ran onto the field (fortunately for everybody, we dont have a picture). -Much less loveable, but through their stupidity certainly entertaining are these Nazis from New Zealand. Please note the sentence about the „…delusions of European culture…“ and the ceremony with the sword (!!!??!!) in the *garage*. Brilliant! PS The game yesterday may have been boring, but in a few weeks Cuba comes to visit (!!!!! ), so we are just going to have to be there again! PPS Positively noteworthy is this flyer. Indeed…“city“ teams are a farce, and at 05 stadium the atmosphere would probably have been better. Du browst gerade in den Fire and Flames Weblog-Archiven nach dem Monat Juni 2009.